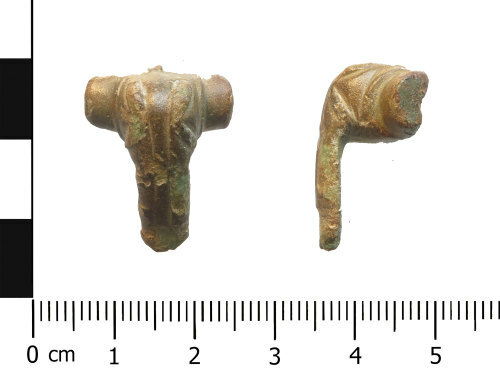 An incomplete cast copper alloy Roman brooch of Colchester derivative Polden Hill (Mackreth Group 4, flat wing ends), Mackreth 2011, 4.i2. Plate 48, dating from AD 80 - 120. The brooch is incomplete due to its missing spring, pin and catch plate. The brooch is T-shaped in plan with the capped wings. The decoration on the bow comprises a number of linear raised markings which radiate out from a central vertical indentation. The reverse face is undecorated. The brooch is of a dark green to brown colour with an abraded patina which covers all surfaces. A number of similar brooches of this type can be seen in Richard Hattatt's (2000) Visual Catalogue of Ancient Brooches; page 300. All the brooches in this section are dated to the 1st and 2nd centuries AD. Parallels can also be found on the database discovered in the Malvern Hills, Worcestershire (WAW-9C28B5) and Wychavon, Worcestershire (WAW-6AA3CC) Bayley and Butcher (2004:160) comment that the distribution of Polden Hill brooches are concentrated in the West Midlands and suggest they date to AD 80 to 120. The brooch measures 23.45mm in length, 18.14mm width (across the wings), and weighs 4.78 grams. Hattatt, R. (2000) A Visual Catalogue of Richard Hattatt's Ancient Brooches. Oxford, Oxbow Books.